Okay, so you all know that I have struggled with anxiety in the past. And a struggle that is in the past should STAY in the past. But, alas, here I am struggling with it again. There are some things going on at my work that is causing me to....well, I haven't had a full fledged freak out yet - but I'm close. Please be in prayer for me. Its too early to know what all is going to happen - but I really like this job and don't want to lose it! Keep praying for Anna too (see next post)!! Thanks! I know I've told you all about my church, and how much I love it. Also I've written about my bible study. Well, one of the ladies in my bible study has an 11 year old daughter, Anna, who is fighting cancer. They are in Houston right now going through treatment. I am asking you if you would pray for Anna's healing and for her mom Dawna while they are away from the rest of their family. I am not sure why, but Anna's story has touched my heart so deeply from the moment I heard that the cancer was back. See God already healed Anna from this cancer last year, and in January, I believe, the tumor came back. We have out church praying for her, and I know they would appreciate all the prayers they can get! Here is her website that is detailing what the family is going through right now. Thanks everyone!! So, I'm at a garage sale a few weeks ago, and it was one of the last ones we were going to go to that morning, and I come across some paintings. I really liked them, the detail was incredible. I asked the lady how much she wanted for them - she wanted $50. I've never paid $50 for something that wasn't a gadget or something I could eat....but I really like these paintings. I talked her down to $40 for the paintings and I bought them! She had said they bought them in the 1970's in the Netherlands. Cool. They are, I believe Oil on Board, and are signed by P.C. Steenhouwer. All I can find on the artist is that he was a Dutch painter that passed away in 1972. I thought I'd bring this all to your attention for one very important reason - they are filming Antiques Roadshow in Palm Springs in June and I have signed up for tickets. According to Google, Palm Springs is only 4 hours away. I'm such a freak. Mostly, I just want to go to see the Keno brothers....but it would be cool too learn more about these paintings. I won't know if I will get tickets until May. It does give me something to look forward to, at least. You too - I may be one of those people on the show where the appraiser says, "Well, unfortunately, there are some condition problems......"
This past weekend I was in Colorado Springs. (I didn't get to see everyone I wanted, but I knew I'd be going back in a month or so anyway, and I would see those of you I didn't see this time, then...) It was sort of a whirlwind trip flying in on Friday evening, staying the weekend with my wonderful hosts Greg and Elaina Gipson and spending Monday at Compassion and flying home Monday evening. My next weigh in will be this coming Tuesday, and I'll let you know how I'm doing then! Thats what I said last week about my weight loss when I only lost 1.6 pounds. "I'll take what I can get." Well, this week I only lost 0.6 pounds...I want what I took last week! Ha ha ha - no, I slacked this week, I'll admit it. PLUS - they had a membership class at my church where they served an awesome lunch...I had to eat it - I didn't want to be RUDE! :) This weekend I'm on vacation - so who knows where I'll be next week, weight wise!! So another week has passed, thought I'd give you an update on my weigh in last night...ready? Drum roll please: 1.6 pounds lost for a total of 11.2 pounds in 3 weeks. I'd like for it to be coming off faster, but I'll take what I can get!! Also I have my bible study tomorrow night. We're going through 2 Peter 2, and I came across this verse that really made me think: "But they deliberately forget that long ago by God's word the heavens exsisted and the earth was formed out of water and by water." (2 Pet 2:5) Perhaps not as striking a verse as others, but this one really got me thinking. It says that 'they deliberately forget' God's word and that He is the one who created the world. (Who are "They"? "They" are the scoffers and mockers who doubt God, and speak against his coming.) Anyway - someone who deliberately forgets something doesn't forget it on accident. They make a decision that they are no longer going to believe something, and they forget the things they used to believe. In this case, man had to come up with something to explain away God's account of the creation of the world. What did man come up with? Evolution. These people deliberately forgot what God's word said and how God said HE created the world in 7 days, and they came up with their own explanation of how things came to be...and now - evolution is being taught as fact. Oh, they say its a theory of evolution, but most people today believe that it is fact. That you and I evolved from monkeys and that the biblical story of creation is just that. A story. Okay, well, many of you that read this are either current or former Compassion employees. But I know there are those of you out there who are not as familiar with the ministry of Compassion International...this post is for you. This month a group of bloggers are heading to Uganda to see first hand Compassion's work in that country. I myself have experienced first (and second) hand Compassion's ministry. I worked for Compassion for 4.5 years before leaving in 2005. It was the best job I ever had. 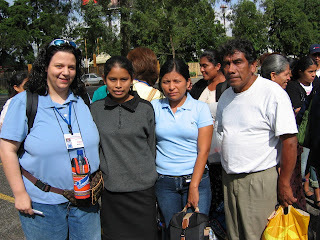 Not only that, I have sponsored three children through my years at Compassion: Cleiton from Brazil, Franci Valdo from Brazil and Lesvia from Guatemala. I have had the incredible opportunity to meet each of these young people in person in their own countries. 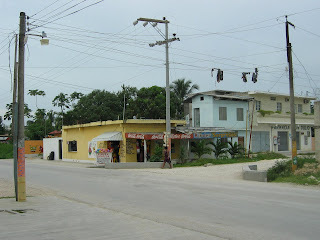 My last trip was to Guatemala in 2006. That was an incredible trip!! We got to visit several Compassion projects, and it just reminded me how much I take for granted everything I have. One home we visited was little more than one room that was divided by a partition with a 'crib' for the babies in the 'living room'. The crib was literally an old crate. The baby was playing with a strip of cloth. That was her toy. I was heart broken. But I also know that Compassion is doing a work in that family. The father used to be an alcoholic and with the church and Compassion's help, he is now working and making an income for this family. I was also fortunate enough to meet Lesvia, my sponsor child and her father on this trip. We spent the day at the Guatemala Zoo. I think the part that broke my heart most was when she was telling me how nervous she was about meeting me, and how she wondered if I would like her. I told her I wondered the very same thing!! 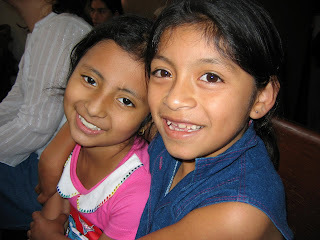 If you are at all interested in sponsoring a child, please click the Compassion banner at the top of this page, or simply click here. 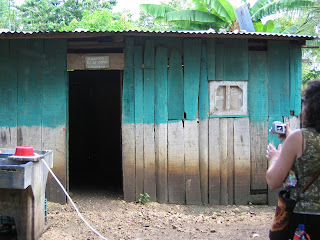 Here are some more pictures from the Guatemala trip in 2006. Enjoy! SPONSOR A CHILD! !